Bryce Canyon National Park, Utah quickly became one of my favourite nationals parks when we visited. Never before had I seen those unique Bryce Canyon hoodoo rock formations found in the Bryce Canyon amphitheatre. We spent about one day in Bryce Canyon, Utah but spread over two: one afternoon where we drove the scenic road to the furthest point, and a morning where we took some chilly hikes in Bryce Canyon National Park. You could easily visit Bryce Canyon in one day if you’re only choosing one hike, but this way we got to witness both a spectacular sunrise and sunset as well which I’d highly recommend! If you are keen for a hike in Bryce, then check out my pick of the best hikes in Bryce Canyon National Park. These hikes vary in ease and some take you down amongst the hoodoos themselves. It’s a great way to see the park! 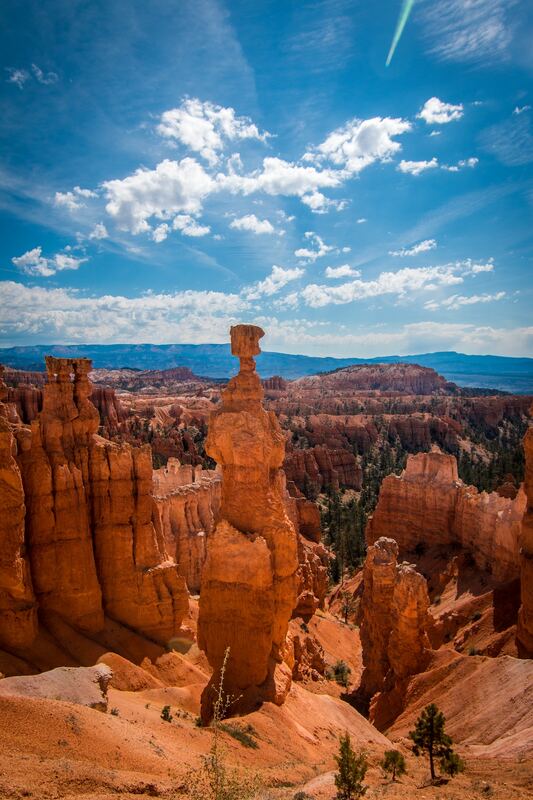 Where is Bryce Canyon National Park located? How big is Bryce Canyon National Park? Want more southern Utah parks posts? Bryce Canyon National Park is in south-west Utah. It’s one of Utah’s Mighty 5 Parks. The 5 Utah National Parks are; Zion National Park, Canyonlands National Park, Arches National Park, Capitol Reef and Bryce Canyon. 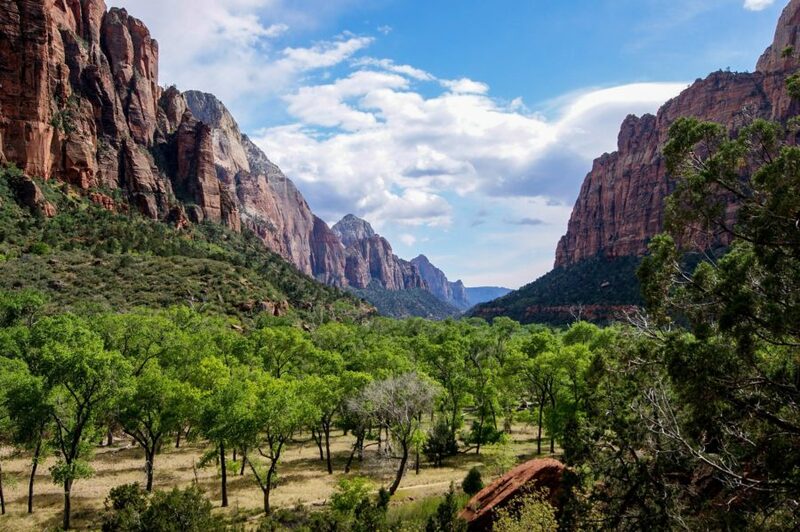 It’s roughly 2 hour’s drive away from Zion National Park. Bryce Canyon covers 35,835 acres of land and it tends to be quieter than nearby Zion National Park. Bryce Canyon’s elevation varies from 8,000 to 9,000 feet (2,400 to 2,700 m) which means winter in Bryce Canyon is pretty chilly! We visited towards the end of April 2017 and there was still snow in parts! 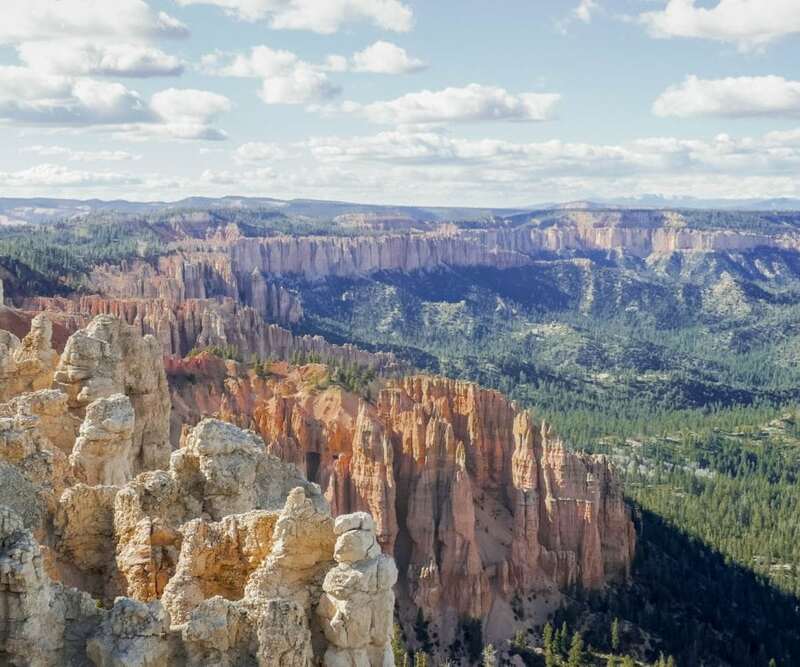 The easiest way to see the park is to drive the scenic road or in busier months it’s recommended that you take the Bryce Canyon shuttle bus since the parking spots will be full up anyway and taking the shuttle is more environmentally friendly. Take a look at this Bryce Canyon map to get your bearings and see the full map of Bryce Canyon National Park here. The entrance fee to Bryce Canyon National Park is $35 per vehicle. If entering by foot or bicycle it’s $20 per person. Motorcycle entrance costs $30 per motorcycle. This admission lasts for 7 days and includes unlimited rides on the Bryce Canyon shuttle bus. If you’re planning on visiting multiple American National Parks or are doing a USA road trip, it’s better to get an America is Beautiful National Parks Pass for just $80. This lasts a year and will save you so much money on a road trip! 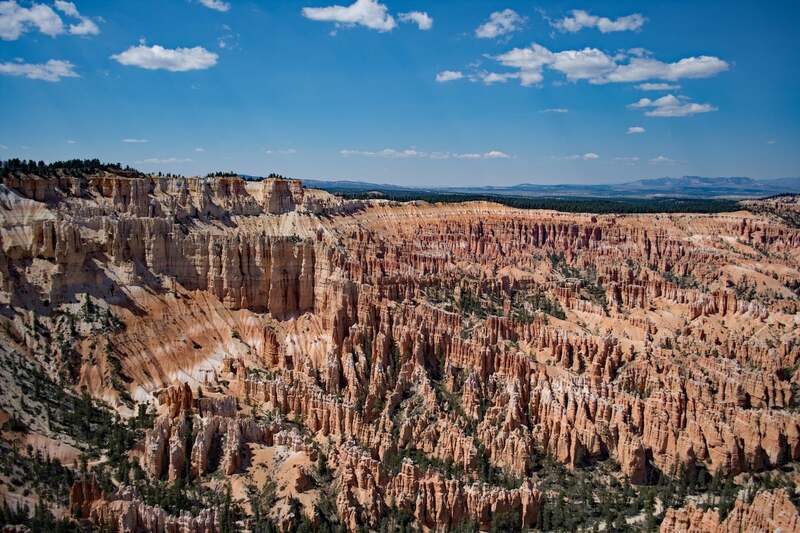 If you’re looking to go hiking in Bryce Canyon, you’re in luck! 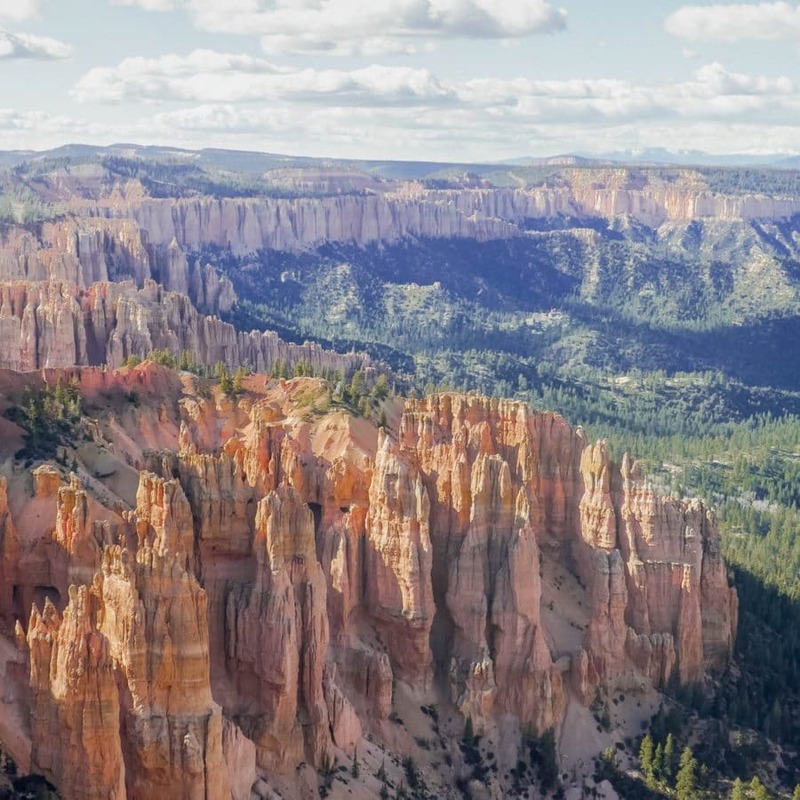 Despite being a relatively small National Park in comparison to others, there are still plenty of Bryce Canyon hiking trails – some of the best Utah hiking in fact! You can also go backpacking in Bryce Canyon if that’s your thing! These hikes are grouped into easy hikes in Bryce Canyon, moderate and strenuous to make it easy to find the right Bryce Canyon hiking trail for you. Most are done as a Bryce Canyon day hike and the last on the list is an overnighter. The easiest hike (so easy it’s basically a walk) is the hike between Sunset Point and Sunrise Point. This easy trail in Bryce Canyon gives you great views of the Bryce Canyon amphitheatre and the famous hoodoo rock formations. It’s a paved trail so it’s easy on the ankles and is accessible to everyone. I’d recommend doing this walk at either sunrise or sunset for the best experience! The north end of the park is probably one of the quietest areas of Bryce Canyon. This section isn’t accessed through the usual park entrance but this trail is well worth making a detour for. This walk along this short Bryce Canyon hike takes you to a mossy grotto that’s either covered in moss or, in the winter, with icicles! You can also take a small detour and visit the Bryce Canyon waterfall. This waterfall isn’t huge but it’s still pretty impressive amongst the red and orange rock of this area. The Queen’s Garden trail is the easiest trail to do that will take you into the Bryce Amphitheatre. It’s not a loop so you will need to retrace your steps back unless you want to take a longer hike into the amphitheatre and return via the Navajo Loop Trail. This trail takes you down to Bryce Canyon’s Queen Victoria hoodoo so called because it really does look like a Queen sitting on her throne! This is the most popular trails to go hiking in Bryce Canyon National Park. It’s also the one I was mentioning if you want to turn the Queen’s Garden hike into a loop. This trail takes you down into the Bryce Canyon amphitheatre and then loops you back up to sunset point via some spectacular scenery. 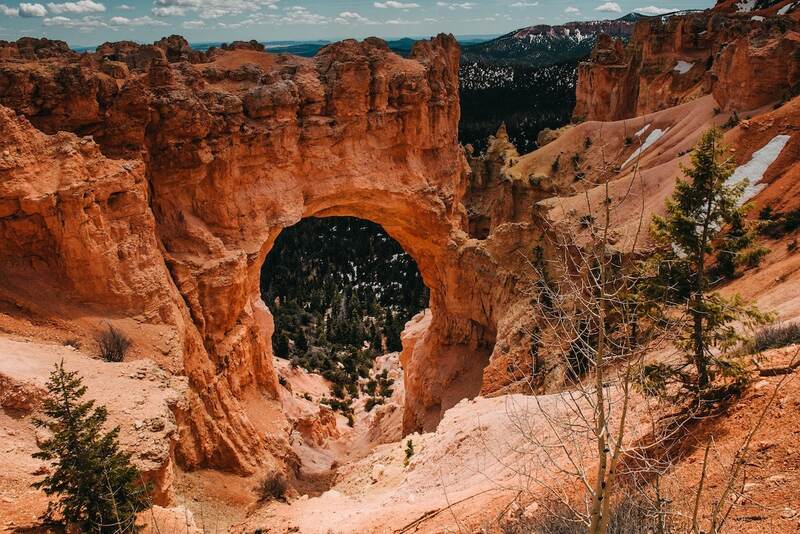 Along the way, you’ll pass Two Bridges (which is the recommended route especially if visiting Bryce Canyon in winter) which is one of the top Bryce Canyon attractions. This is only a loop during the summer months as part of the trail is closed in winter since it gets pretty slippy! Along the way, you’ll see Thor’s Hammer (a small boulder balancing on top of a tower), Two Bridges and Wall Street which is a cool part of the trail where you’re surrounded by the rocks and pass through a fairly narrow corridor between them. This trail takes you through a quieter section of Bryce Canyon National Park and into the backcountry. Make sure you have a good trail map as there aren’t as many signs and trail markers here as there are within the Bryce Canyon amphitheatre. This trail begins at Swamp Canyon and you can take either the Swamp Canyon trail or the Sheep Creek trail first before returning along the other one to make it a loop. Another popular Bryce Canyon hiking trail is the Fairyland Loop trail. This hiking route in Bryce Canyon combines hiking along the plateau rim with amazing views of the Bryce Canyon Amphitheatre. You’ll be surrounded by hoodoos during this hike and it’s a great one to try if you’re an experienced hiker looking for something different to do. It’s a long one, but beautiful! 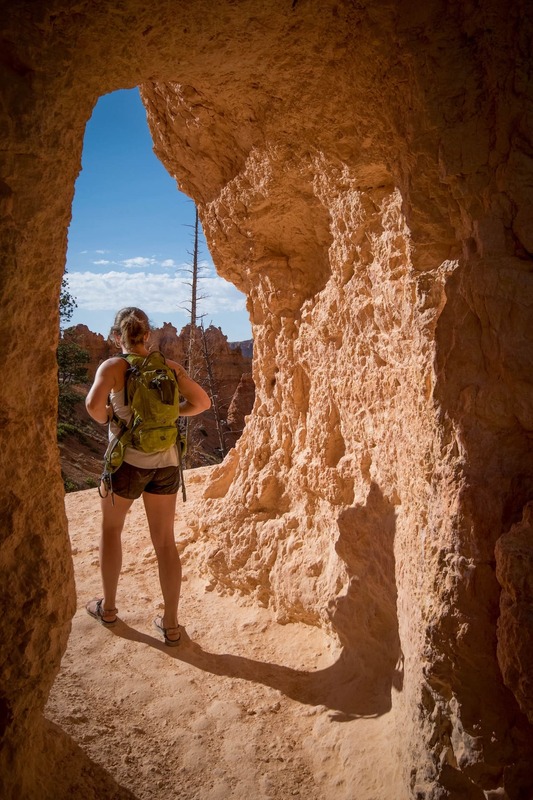 Peekaboo Loop is one of the quintessential Bryce Canyon hikes. This hike is entirely below the rim and takes you past the impressive Wall of Windows where there’s a group of hoodoos with window-like holes in them. It’s recommended you do this clockwise and be sure to take a trail map with you. You can also combine the above two hikes and turn it into a mini figure of 8 by taking the Two Bridges route down towards the Peekaboo Loop, completing the Peekaboo Loop and then coming up along the Wall Street route of the Navajo trail. If you’re keen to do some Bryce Canyon backpacking then opt for the Under the Rim trail in Bryce Canyon National Park. This trail takes you completely under the rim from one end of the park to the other. It’s done as an overnight trip and to do so you’ll need to pay for a backcountry Bryce Canyon camping permit at the visitors’ centre beforehand ($5). There are 8 campsites along the way and you must camp in designated areas. You’ll get away from the crowds on this trail and meander through forest, meadows and past the beautifully coloured cliffs. The hoodoos become part of the distant vista as you hike along the valley floor. To do this trail you must have good wayfaring skills, be an experienced backpacker and store food in bear canisters since the backcountry of Bryce Canyon is home to mountain lions and black bears. Notes: For more information about trail safety & permits see the NPS site. If you’re doing an overnight hike you’ll need to purchase a Bryce Canyon backcountry permit. You MUST buy these in person at the visitor centre and they cost $5. 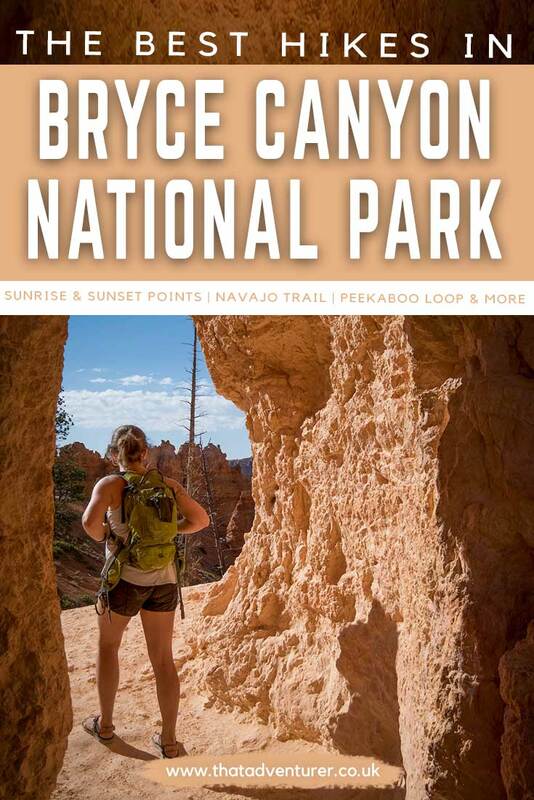 Do not rely on phone signal to find your way, always take a Bryce Canyon hiking map. There aren’t a lot of choices when it comes to lodging inside Bryce Canyon National Park. 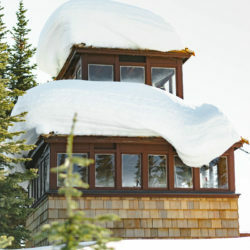 If you are set on staying within the park boundaries then you can book a room at The Lodge at Bryce Canyon. This Bryce Canyon Lodge offers some cabins, motel rooms and guest suites & studios to book. For other places to stay near Bryce National Park take a look at the top picks below. Take a look at these highly recommended Bryce Canyon hotels in the towns near Bryce Canyon. It is possible to find free campsites near Bryce Canyon (we did), check out this post for how to find free places to camp in the US & Canada. If you’re RV camping or prefer to stay in camping resorts then check out Ruby’s Inn, Bryce Canyon. It’s also super close to the park entrance. If you’re backcountry camping as part of the Under the Rim trail then there are 8 Bryce Canyon campgrounds to choose from and a permit must be bought in advance.